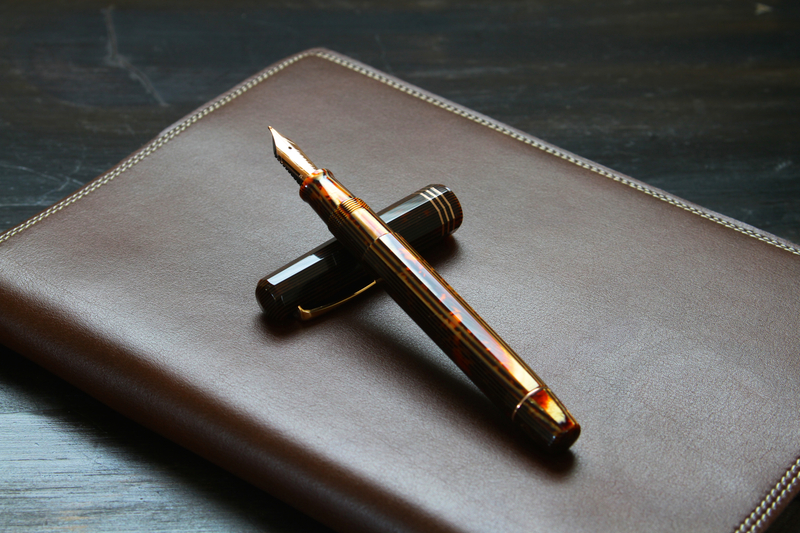 Description: Quite possibly one of the nicest looking fountain pens I have ever seen, the Omas Paragon in Vintage Arco Celluloid is a perfectly balanced, great writing pen. Wow. That’s the first word that comes to mind when I see this pen. The Omas Arte Italiana Milord in Arco Celluloid is one of the most stunning pens I have ever seen. Huge thanks to my friends over at Kenro Industries (the US distributor of Omas, Aurora, Sheaffer and Montegrappa) for letting me borrow these beautiful pens for review. I hope you enjoy the review as much as I did spending time with these pens! This review is based on the gold finished model with a fine nib. This is also the first review shot with my new Canon 7D, make sure to click the images and supersize them for the full effect! Where to start… This pen is absolutely beautiful. Great vintage styling and an amazing, deep celluloid that looks almost as if it is on fire when in the right lighting. The pen has 12 flat sides that not only give it a great look, but prevent it from rolling off the table or desk. The gold accented model perfectly compliments the colors of the celluloid. Out of the three trims (gold, rose gold, and rhodium) the gold is my favorite. 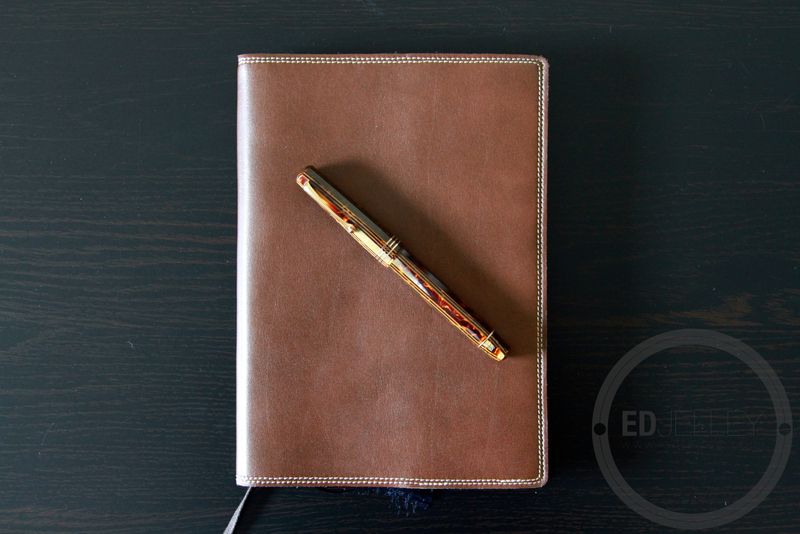 There are 3 thin cap bands that go well with the overall vintage design of the pen. The gold nib has a classic arrow style pattern, reminiscent of the old Parker nibs. It’s a great looking pen that just works on so many levels. Omas did a great job on this one…seriously. The nib on the Omas has a great nib. 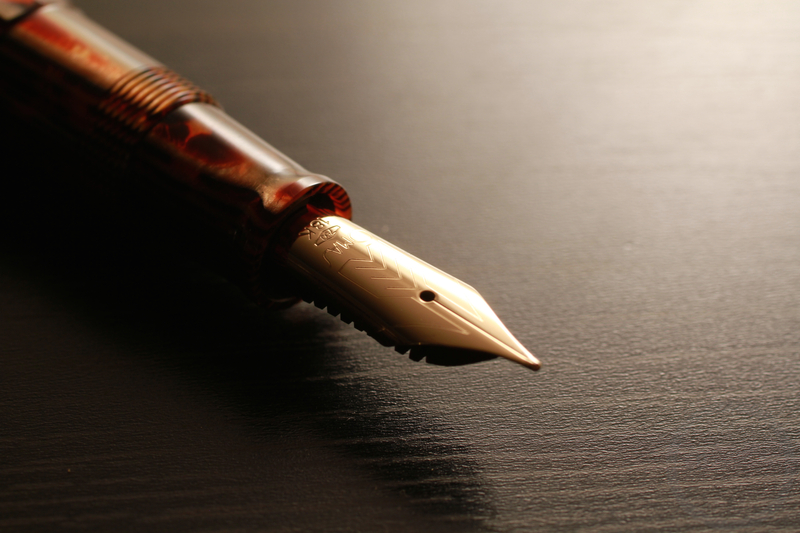 It’s actually more than great, it’s probably one of the best pens I have ever written with. The 18k nib has a bit of cushion with normal writing and it’s capable of some nice line variation if you push it just a little bit. The nib is buttery smooth and always starts up, even if left uncapped on my desk for a few minutes. This is the first Omas I’ve tried so I wasn’t really sure what to expect. While doing some research I found that most Omas pens do indeed write very wet out of the box. See the handwritten review pictures for an example of the line variation possible when pushing the nib. It’s a top-tier pen that has a price tag to match, but it definitely looks, writes and feels like one. The Omas is not too big and not too small, for me it’s just right. The pen is rather lightweight at 20g, weighing in just under a Lamy 2000. Posting the cap lengthens the pen quite a bit, but it still maintains its excellent balance. I prefer writing with this pen unposted though. There are several steps in the barrel, all of which are very small and transition nicely into each other. There are no sharp edges and the threads are practically unnoticeable – making for a very comfortable writing experience. 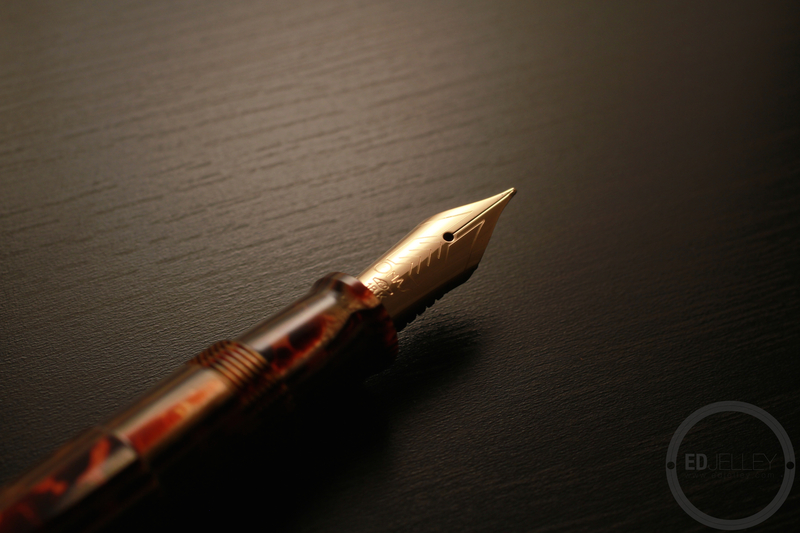 The light weight of the pen and the nibs ability to glide across the paper make for an excellent overall writing experience. The Arco celluloid is smooth to the touch and warms up in your hand as you write. The pen is the perfect size and weight for me and it practically disappears into my hand. Longer writing sessions are a breeze. The Omas Special Edition Arte Italiana Arco Celluloid Paragon is quite expensive, but I can totally understand why. It is a piece of functional art that shows off the history of the brand. It also doesn’t hurt that the nib is amazing, and it is one of the best pens I have ever written with. The Arco celluloid practically glows in your hand as the light catches it. It’s a beautiful looking pen that is not overdone in any way. Huge thanks to my friends at Kenro Industries for loaning me these pens to review, I’m going to have a hard time giving this one back! Beautuiful pics on one of my favourite pens! Well done. Looks like you’re putting that new Canon to good use! Great review. One of the few pens I’d say is worth the price. Oh I am. It’s awesome, makes a huge difference. Great review. OMAS truly makes some beautiful pens. 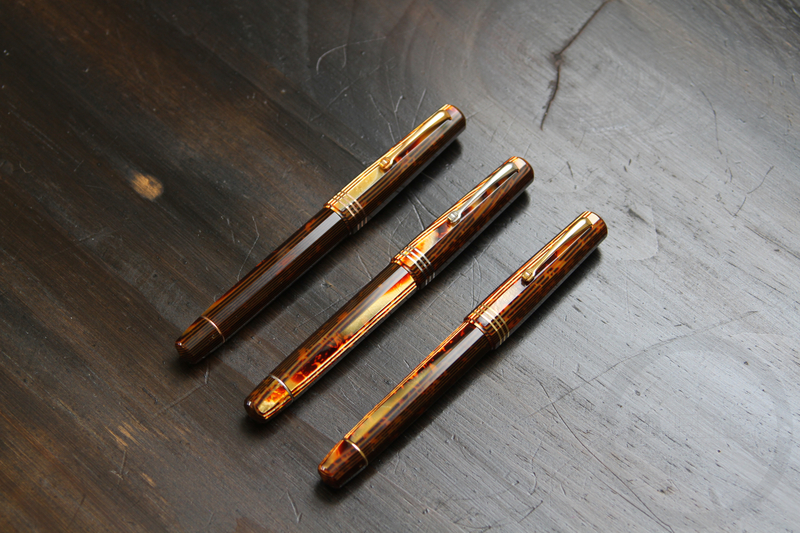 If you look at vintage (1930s + 1940s) Aurora, Ancora, Columbus, and of course OMAS, they all made beautiful faceted celluloid pens just like these but OMAS is the only one that has continued to produce them. I ran into some problems with my OMAS pens from the 90s and early 2000s so I haven’t had one in a long time but your beautiful pictures are tempting me. This one writes amazingly well. The 18k nib has just the perfect amount of spring and cushion to it. 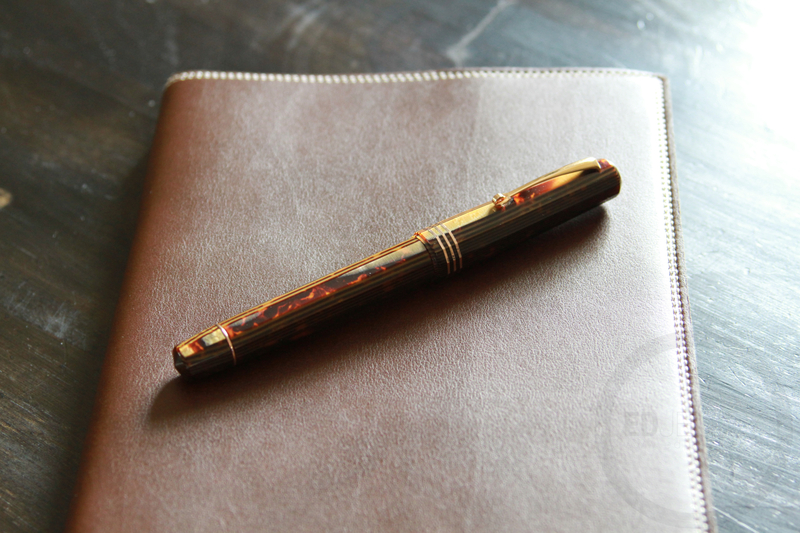 The celluloid is one of the best looking materials I’ve seen a pen made out of as well. It doesn’t feel like the most durable pens ever, and celluloid is rather fragile – but it’s still pretty great. What notebook is in the picture? Gorgeous photography! 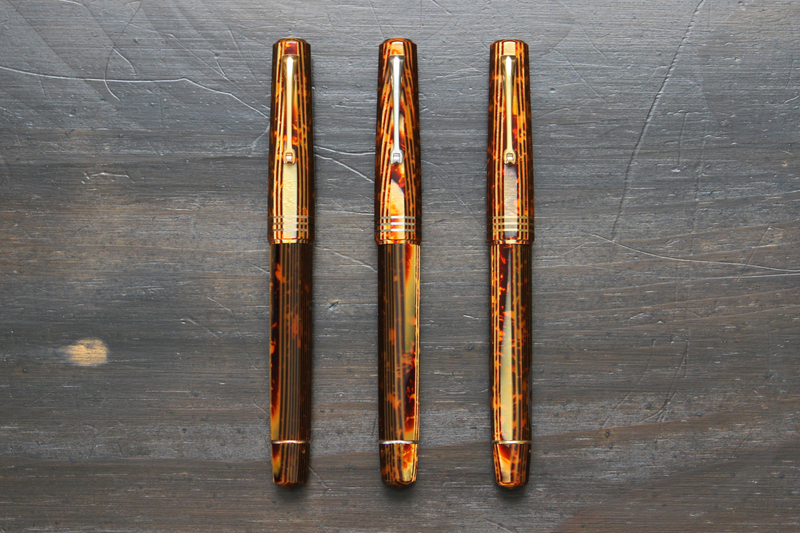 I’ve been aching to get an OMAS in Arco Brown/Bronze for a long time. It was a toss up between this older style “vintage” and the newer Paragon/Milord style which are bigger and have the larger clip and different cap band. Thankfully, your review coupled with the amazing photography convinced me to get the vintage one. I learned as well that these are limited editions and each trim has only 75 available. A few places still stock them, so better to grab one now than wait! Thank you! It’s a great looking pen that writes just as nice. I much prefer the Vintage style, I think the clip and cap band are a bit clunky on the regular edition. You just missed a sale on Goldspot Pens! You mentioned the Milford. What are the comparable specs between the MIlford and Paragon? Is the Milford more practical? 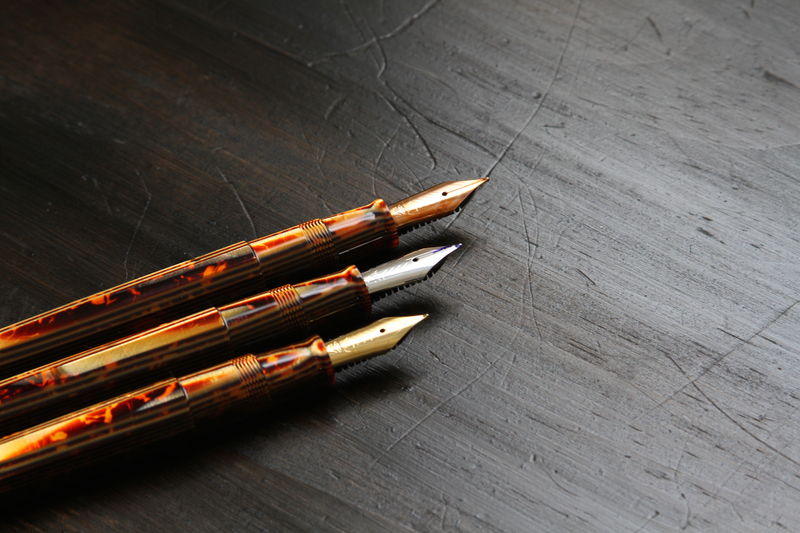 Did you ever get the nib worked on by Pendleton? Do you still like the pen? I’ve started looking around for a Paragon but they’re hard to come by. Nope, never had anything done by him. These pens were on loan, and they’ve been sent back for a while now. I did really like the pens in my time with them, I would have added one to my collection. Omas is in a transitionary period, they were sold to a new company and I don’t think they’ve been fully rebooted yet.